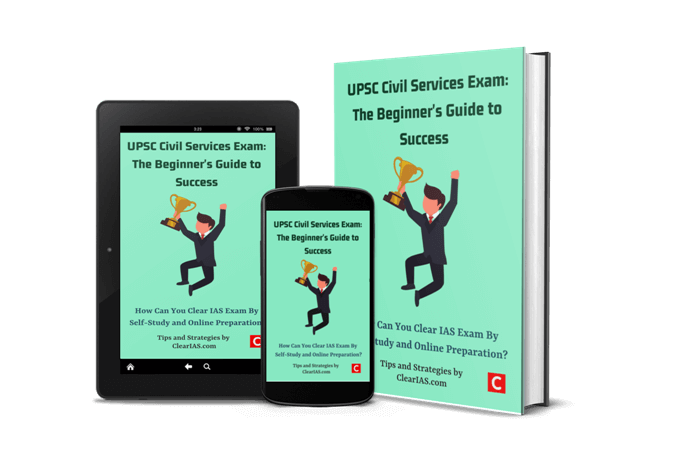 ClearIAS has published a new ebook (PDF) “UPSC Civil Services Exam – The Beginner’s Guide to Success”. Aspirants who dream to start a career in IAS, IPS, or IFS can download this book (PDF) for FREE from ClearIAS Online Book Store. Be sure you put your feet in the right place. Then stand firm. – Abraham Lincoln. Unless you have the proper action plans and right strategies from the beginning, it’s not easy to clear the ‘IAS exam’. The ClearIAS Beginners Guide is created to provide aspirants with the right guidance. Learn the UPSC Exam Requirements, First! With thousands of coaching institutes and websites mushrooming, now there is no shortage of ‘gurus’, books and PDFs – online and offline. Unsure what to study and what not, aspirants go behind each and everything. Unfortunately, despite that these study materials ran into thousands of pages, most of these books and PDFs contain very little information useful for Prelims or Mains. The returns on the invested time and money will be very less unless you know exactly what UPSC requires. Road Map to Success in the UPSC Civil Services Exam! Whether you a school/college student who aspires to become an IAS officer OR a veteran who is struggling to clear UPSC CSE despite trying multiple times, the ClearIAS ebook (PDF) “UPSC Civil Services Exam – The Beginner’s Guide to Success” can be a real game changer for you! We have outlined what should you give focus during every month – right from the start. ClearIAS Beginner’s Guide – The Pathfinder! If you fail to clear IAS, let that be after giving your full effort. You should never lose because of misguidance. In the digital age, by following ClearIAS guidance, study materials, and mock exams, you can clear IAS by self-study and online preparation. There is no greater proof of that than our topper’s testimonials. If they can do, you too can do it. All the best!